Nobody is going into The Meg wanting high art – they just want to see Jason Statham fight a giant prehistoric shark, in a man-vs-monster mano a mano as the advertising highly suggests. Is that what audiences are going to get, or is the film the latest in a long line of dumb blockbusters saddled with a generic script with stock characters and clichéd dialogue? In the case of The Meg, it’s both; Jason Statham does indeed go one on one with that giant creature, but surrounding such an awesome mental image is exactly the kind of schlocky movie you’d expect it to be, with characters who range from cardboard cut-outs stock to just being there as appetisers, and the kind of B-movie disaster/monster flick story that you would see from something in the 1950s. It’s dumb, predictable, and doesn’t make a ton of sense – but then again, the same can be said about the idea of Jason Statham fighting a bloody giant shark, and they still manage to at least deliver on that front; anything else, though, is much more debateable. Statham plays a guy named Jonas Taylor, a former diver who is called into action when a submersible exploring the depths of the ocean, as part of a research mission conducted off the coast of China, is attacked and leaves its three passengers stranded, including Jonas’ ex-wife Lori (Jessica McNamee). As he makes the dive, however, he and the rest of his team make a horrifying discovery; a giant, prehistoric Megalodon shark, once thought to be extinct, is roaming beneath the clouded ocean bed, and what’s more, Jonas has a history with it; an opening prologue sees him five years prior making the difficult decision to leave some of his men behind on a rescue mission after said shark interrupts their operation, with his claims later rebuffed and causing him to lose his job and credibility. In the present, Jonas is now faced with a chance to get even with the shark, before it can reach the surface and cause havoc. The hacky thing to do in this review would be to make comparisons to other popular shark movies in the past, like Jaws, Deep Blue Sea or even Sharknado, but I would instead like to offer an alternative movie to compare it to: Rampage, from earlier this year. Yeah, it’s not a shark movie, but it is another effects-heavy B-movie that sees giant animals – in that film’s case, it was a mixture of albino gorillas, wolves and crocodiles – roaming about and wrecking nearly everything in their sight, and also happens to feature one-half of the leading actors from the upcoming Fast & Furious spin-off Hobbs and Shaw. The thing is, though, Rampage at least had a sense of what it was, a big and silly B-movie with a somewhat tongue-in-cheek premise and a knowing lead performance by Dwayne Johnson; with The Meg, it’s hard to know what its intent is half the time, to either be knowingly silly or playing it so straight that any sense of ridiculousness is lost. The only actor in the ensemble who seems to be somewhat aware of what kind of movie they’re in is Statham, while everyone else either plays it really straight or so silly that it doesn’t fit with the tone it’s aiming for. You’ll have serious performances by actors like Winston Chao and Cliff Curtis, but also ones by people who think they’re in a much funnier movie than it is like Rainn Wilson or Page Kennedy; it’s a weird mix of performances from an otherwise talented cast, and they contribute to the confusion of what this movie is supposed to be, since you’re either unsure whether to laugh along with and/or at it, or whether you’re expected to take it seriously the whole way through. This was a movie that up until now was stuck in development hell since 1996, and in that time it was passed around several different studios and directors (including Jan de Bont and Eli Roth) before it finally settled on Warner Bros and director Jon Turteltaub respectively, and honestly at times it does feel like a movie that had its first draft written during the late 90s, roughly around the time when every big blockbuster was trying to be Jurassic Park or Independence Day, or in some cases a combination of both. Here, the characters feel very 90s, the plot feels very 90s, and even some of the effects feel like they were originally from the 90s but have since been updated with today’s slicker technology; it’s almost like a lost 90s B-movie in a way, one that should have come out all those years ago but because of several rights issues, most of them belonging to Steve Alten (the author of the book this movie is based on), didn’t. The problem is, it’s not one of the more entertaining ones; outside of the final act, which is when it finally gives us what was hinted during the advertising, most of it is made up of these generic characters with little to no personality (except Statham, because he’s Statham) going around and doing mostly dull things, which slow it right down and drain the excitement just a tad too much because there’s nothing fun going on for us to latch on to. It’s all just stuff that’s been done time and time again in these types of movies, and I feel that I’m right on the money when labelling this as a lost 90s B-movie because I don’t know about anyone else but that’s the vibe I certainly got from it. But the all-important question still remains: does Jason Statham actually get to fight a giant shark? The short answer is, kind of. Unfortunately, you’re going to have to sit through a mostly dull B-movie in order to find out how he pulls it off. 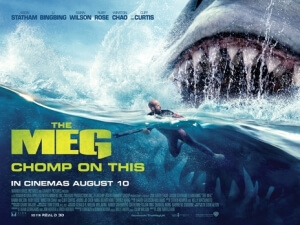 The Meg is a mostly dull and tonally inconsistent B-movie that’s neither fun nor entertaining enough to keep itself afloat, because while Jason Statham at least has a sense of the kind of movie he’s in, the rest of the ensemble doesn’t seem too sure, and their wildly varied performances contribute to the confusion of what this movie is trying to be, whether it’s a knowingly silly B-movie or one that we’re supposed to take way too seriously. Either way, it’s not something to chomp on.